Do you consider whole wheat buns a superfood? What do you think of when you hear [amazon_link id=”B0038B3AAK” target=”_blank” ]superfoods[/amazon_link]? I think of foods high in phytonutrients and/or antioxidants like spirulina, broccoli, and blueberries known to “lower your cholesterol, reduce your risk of heart disease and cancer”. The term superfoods has been accused of becoming a marketing term, and it appears Sesame Street has jumped on the bandwagon with their new Superfood Muppets. The Food for Thought program will provide families with an educational outreach kit, which includes an original video featuring the debut of four new Sesame Street Muppets, the “Superfoods.” The video also features Elmo and friends, along with real families as they try new foods, learn about the importance of healthy snacks, and discover that sharing a meal together is a perfect opportunity to connect as a family. There is also a special section for parents and caregivers that addresses the social and emotional issues related to food insecurity; and a segment with award-winning chef Art Smith, who shows families how to stretch a meal and shop locally while saving money. Although I commend Sesame Street for being concerned about children’s nutrition and food insecurity, there are two things wrong with the new Superfoods Muppets. 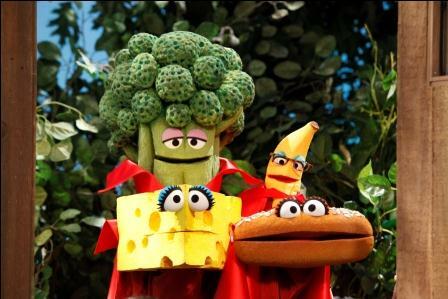 The new superfood muppets are a banana,a block of cheese,a whole wheat hamburger bun and a stalk of broccoli. Not coincidentally, this muppet selection looks a lot like the USDA’s food pyramid which has nothing to do with promoting healthand everything to do with promoting the financial interests of the meat, dairy and grain producers. But hey, at least Sesame Street didn’t feature any processed meat in their superfood muppets. Not yet anyway. The fact that Merck is a partner in this new endeavor just reeks of suspicion. Pharmaceuticals make money off of sickness, and by promoting non-superfoods as such, it appears Big Pharma is behind duping parents and children about health and nutrition. It is not that bananas, whole wheat buns, and cheese are not healthy (although buns and cheese can be processed and contain additives), it’s simply misleading. Like any large corporation, and Merck is one of the largest pharmaceutical companies in the world, Merck has created a foundation for charitable work. Contributing to Superfood Muppets makes the company feel like they are supporting “important initiatives that address societal needs and are consistent with Merck’s overall mission to help the world be well”. I just don’t buy it considering the company’s history of Medicaid overbilling and air pollution. I grew up on [amazon_link id=”B002K0WBWI” target=”_blank” ]Sesame Street[/amazon_link], although my children never took an interest the few times they were exposed to the program. I remember Bert and Ernie, [amazon_link id=”B0007ZCJRK” target=”_blank” ]Snuffleupagus[/amazon_link], and Cookie Monster. I wonder if today’s children will feel the same way about Merck’s Superfood Muppets. Gha! Just because the colloquial term “super food” is used in a different way than you conceives it, you assumes pharmaceutical companies are using Sesame Street to make kids sick! Really? Poor children have very little access to fresh blueberries and pomegranates. I think we can call it a win if they ask for whole wheat bread instead of white. I think that’s super. I think these foods would be quite a step up for a lot of families. I see moms giving their kids Pringles, 100 calories cookie packs, or even cupcakes for snack time and it drives me up a wall. No wonder we have more and more children with behavioral issues and who struggle with their weight. However, I do agree that in an ideal world there’s no way that cheese, or any dairy product, would be seen as a “super food”. Cows’ milk is for feeding calves and fattening them up to become cows, so why do want a part of that? Calcium! Except there are many, many other foods that offer calcium without the fat and without the [potential] animal cruelty. And processed breads should be a no brainer. Whole wheat (although it’s usually not actually whole grain) IS a step up from bleached flour, but the more we process, the less beneficial it becomes to us. I don’t necessarily think this is corruption, just taking baby steps away from, say, Cheetos and Capri Sun. Should Formula Ads be Restricted like Tobacco?